The Bosch RS7 Reciprocating Saw is a competitively priced powerhouse addition to the toolboxes of professional and recreational carpenters, builders and remodelers. This dynamo has a power-to-weight-ratio that is best in class, meaning you’ll have more than enough power for any cutting job, without needing excess space in your tool shed. The ten blade set and tool-less blade changing functionality limits wasted time and increase versatility, allowing several cutting jobs to be completed on the fly. The ergonomic handle and variable speed trigger ensure that, despite packing a serious wallop, you’ll always be in complete control of your cuts. What Sets This Reciprocating Saw apart from the Rest? The Bosch RS7 has the best power to weight ratio in its class, meaning that you are getting more cutting power than you’d typically expect from a saw of this size or at this price point. This means that the saw will accept any job you throw at it, no matter how challenging, whilst the durable design and impressive build quality mean that the performance will remain consistent cut after cut. Despite the increased power, the Bosch RS7’s variable speed trigger allows for fine-tuning of the output depending on the job at hand. This control, along with the 10 blade set and keyless blade clamp, improves versatility and allows the tool to be used for almost any cutting project. Whilst possibly its most simple feature, the saw hook is a great addition to the Bosch RS7, allowing for easy and convenient storage of the saw whilst not in active use, particularly useful when cutting on a ladder. The 11-amp 120V motor of the Bosch RS7 Reciprocating Saw packs a serious wallop despite its relatively small body, resulting in a saw that has the best power to weight ratio in its class. As a result, the Bosch RS7 Reciprocating Saw is able to cut through any materials thrown at it with an ease and speed that is superior to models of a similar size and price point. At 19 inches and 8.5lbs, the Bosch RS7 is not quite as mobile as some of its competitors, although the excess weight and size do not limit the saw’s performance unduly. Despite its impressive power, the variable speed trigger and ten blade set that comes standard with the Bosch RS7 reciprocating saw increases control and allows for the saw to be used for more technical projects too. The RS7 is very smooth, running at a comfortable rhythm that does not feel noticeably jarring when in use. The tool-less blade changing system allows for blades to be changed on the fly, improving the speed in which projects are completed. 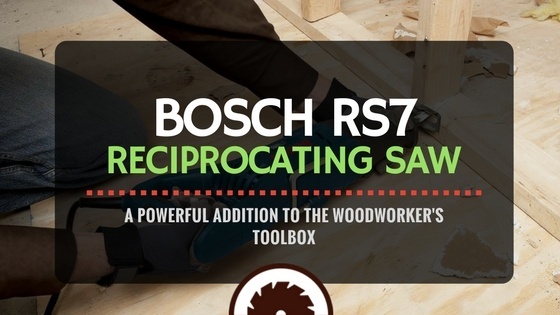 Both experienced saw owners and novices alike will love the Bosch RS7. Its soft rubber-laced ergonomic handle improves comfort and provides maximum grip, ensuring that the saw is not at risk of slipping whilst in use. The increased power means that the saw effortlessly cuts through all materials thrown at it, without the need for extensive experience of saw usage. The intuitive design and variable speed trigger allow for increased control on more technical projects. However, the increased power can be a little overwhelming for novice saw owners and may result in less refined results with the first few attempts. Bosch is an industry leader and, like all of its products, the RS7 is made with high-quality materials and a rugged finish. The 11 amp 120V motor is very impressive and fantastically made, especially considering the machine’s size and relative inexpensiveness. The machine is durable and stands up well to constant use, whilst the blade quality is high, cutting through wood, nails or PVC piping without buckling or distorting over time. The blade locking mechanism is, however, somewhat flimsy, making the blades difficult to switch at times as well as less secure when in use, which is the biggest complaint leveled at the machine by other users. The Bosch RS7 Reciprocating Saw comes with a one-year manufacturer warranty and a 30-day money back guarantee. The Bosch RS7 is charmingly rugged, finished with practical rubber lace and the traditional two-tone Bosch color-scheme. This ensures that the saw looks good but also increases grip, ensuring that the saw feels secure when in use. The soft-grip ergonomic handle has been designed with performance in mind, dramatically decreasing wrist fatigue over extended use when compared to saws of a similar size. The machine is slightly bulkier than other corded saws in this bracket, meaning that it can be slightly more challenging to store and transport, particularly given it only comes with a soft storage bag rather than a case. However, the storage hook is an excellent feature, allowing ease of storage when on the job, particularly useful when operating the saw on a ladder. The Bosch RS7 Reciprocating Saw is extremely competitively priced given the power to weight ratio it offers. Whilst not the cheapest saw in its class, it is far and away the best value for money in pure cutting power terms. The 10 blade set and variable speed control mean that the saw is not confined to robust cutting jobs and this flexibility means that product must be considered great value for money. The high-quality Bosch manufacturing ensures excellent results over many years. The Bosch RS7 can be purchased online from most reputable tool-sellers and is shipped to a variety of countries. The Makita JR3050T is also an 11-Amp corded saw, with a variable speed trigger and tool-less blade change system, just like the Bosch RS7. However, the Makita is lighter than the Bosch (only 7.3 lbs) and comes with a hard carry case, making the saw more mobile and easier to transport than the Bosch RS7. The Makita comes with a ball and needle bearing, increasing the projected life of the tool. A great added feature of the Makita is the built-in dust blower, clearing the line of debris during use, for greater accuracy. The performance is not as impressive as the Bosch RS7 and is likely more suited for smaller projects and framers, carpenters and electricians whose job sites are constantly on the move. The DeWALT DWE304 Reciprocating Saw has a 10-Amp motor, rather than the 11-Amp motor of the Bosch RS7, although both tools are designed for heavy-duty use. It also makes use of a keyless blade change system and variable speed trigger, for fast blade removal and precision cutting, just like the Bosch RS7. The DeWALT DWE304 can deliver up to 2800 strokes per minute, 100 strokes more than the Bosch RS7, although the increased power of the Bosch RS7 means that most cutting jobs will be completed in a similar time frame, with the ease and control of the Bosch GS7 giving it the edge in longer cutting jobs. A great feature of the DeWALT DWE304 is the three-year manufacturer’s warranty, compared to the one year warranty of the Bosch RS7. The RS325 is only 17.8 inches long and weighs only 7 lbs, meaning it is a far more compact and mobile option than the GS7, allowing for greater dexterity. This means that the RS325 can be used in far more challenging locations than the RS7. The soft ergonomic handle and tool-less blade changing system will be familiar to users of the RS7, ensuring maximum grip and fast, efficient blade changes when in use. The RS325 allows for up to 2800 strokes per minute, 100 more than the RS7, giving it the edge with smaller projects. The RS325 also comes with a carry case, rather than a soft carry bag, which is a feature that is popular with consumers and compliments the more lightweight and mobile nature of this product. Whilst still a powerful unit, its performance is not quite as impressive as the RS7 and is likely to be preferred by consumers used to working in more cramped locations or whose work moves around regularly.